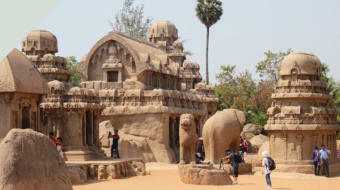 Mamallapuram is an ancient port city on the Coromandel Coast that is an extra-ordinary place for art connoisseurs of Pallava art. 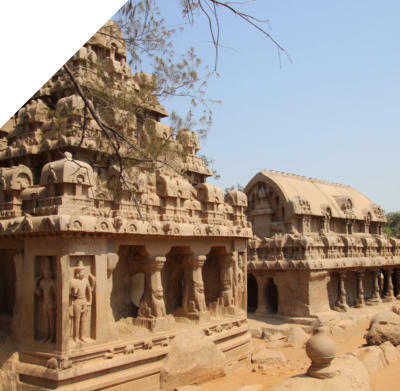 It’s like a museum with its remarkable range of temple architecture – cave- temples, monoliths, open-air bas-reliefs and structural temples. The Five Rathas are 7th century temples carved from single large rocks. 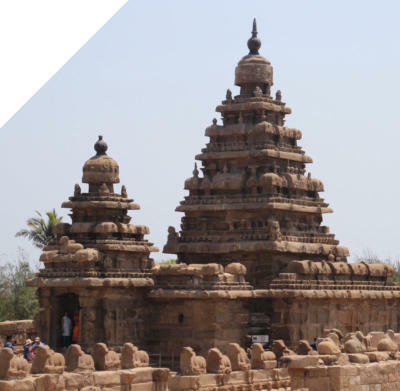 Ratha is Sanskrit for 'chariot', and may refer to the temples' form or to their function as vehicles for the gods. 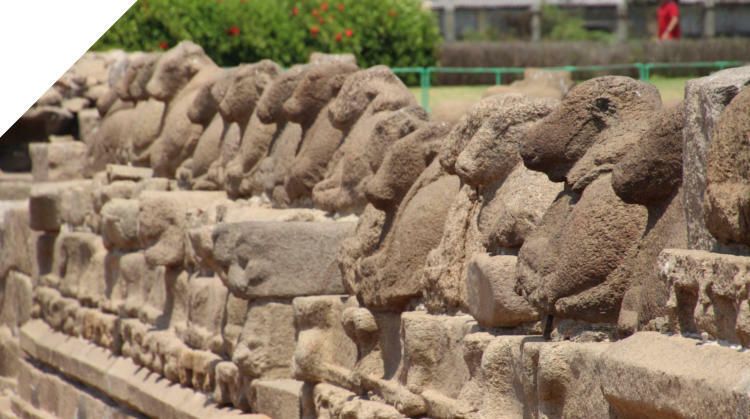 It's thought they didn't originally serve as places of worship, but as architectural models. The rathas were hidden in the sand until excavated by the British 200 years ago. 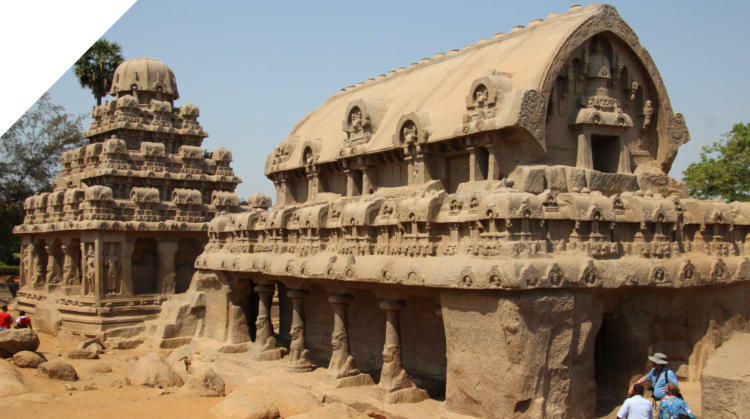 It’s an amazing sight to stand and appreciate the sheer complexity and difficulty that would have confronted the artist working on the granite rocks..
Overlooking the sea, surrounded by gardens and ruined courts, the two- towered Shore Temple symbolises the heights of Pallava architecture and the maritime ambitions of the Pallava kings. 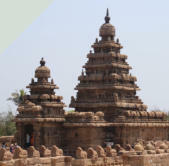 Built under Narasimhavarman II in the 8th century, it's the earliest significant free-standing stone temple in Tamil Nadu. 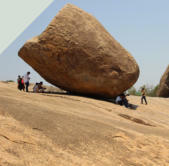 Rocks have been used as canvas in an unusual enterprise not found anywhere else on this scale. There are five masterpieces, the most impressive being the Great Penance panel. 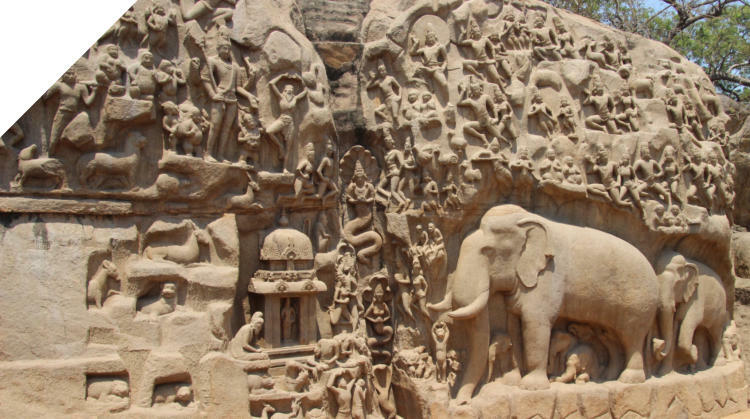 It measures 100 feet long and about 40 feet high and has been carved on two large boulders with more than 150 mythological characters. 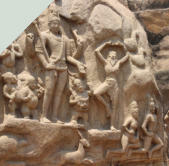 Even the fissure between the 2 rocks has been sculpted. This is one of those unexplained mysteries in science. 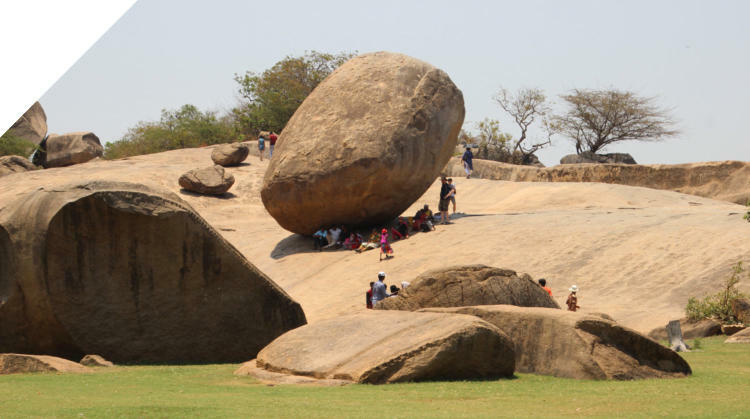 The “butterball” is a giant balancing rock, 5 meters in diameter and estimated to weigh over 250 tons, perched on a smooth slope, seemingly defying all laws of physics. The rock is balanced upon a 4 feet slippery area of the hill. 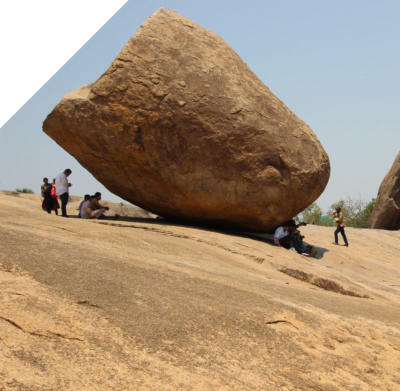 In 1908 the then Governor of Madras Arthur Lawley decided the boulder to be too dangerous to nearby homes and wanted it removed. Seven elephants were employed to push the rock. But to everyone’s surprise the rock couldn’t be moved and the task was abandoned. 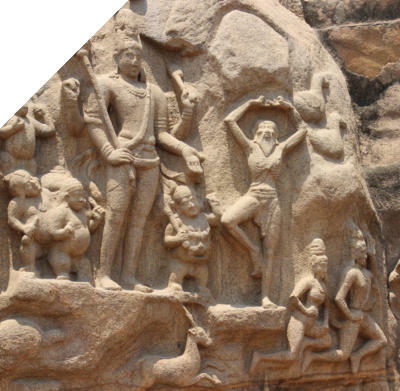 In Hindu mythology Lord Krishna had an insatiable appetite for butter, and as a child, would often sneak a handful from his mother’s butter jar. Situated on a hill slope near the Ganesh Ratha this massive natural rock boulder is attributed to a bolus of butter the young Krishna would steal. Mahenra Pallava (590-630), the Pallava patriarch explored rock architecture and sculpted many cave shrines of hard granite rocks and his descendants followed the practice of monolithic rock cut temples. Many of the rock sculptures are in an unfished state.